The Economist Discusses “The Tradgedy of the High Seas” – Neptune 911! IN 1968 an American ecologist, Garrett Hardin, published an article entitled “The Tragedy of the Commons”. He argued that when a resource is held jointly, it is in individuals’ self-interest to deplete it, so people will tend to undermine their collective long-term interest by over-exploiting rather than protecting that asset. Such a tragedy is now unfolding, causing serious damage to a resource that covers almost half the surface of the Earth. The high seas—the bit of the oceans that lies beyond coastal states’ 200-mile exclusive economic zones—are a commons. Fishing there is open to all. Countries have d eclared minerals on the seabed “the common heritage of mankind”. The high seas are of great economic importance to everyone—fish is a more important source of protein than beef—and getting more so. The number of patents using DNA from sea-creatures is rocketing, and one study suggests that marine life is a hundred times more likely to contain material useful for anti-cancer drugs than is terrestrial life. Yet the state of the high seas is deteriorating (see article). Arctic ice now melts away in summer. Dead zones are spreading. Two-thirds of the fish stocks in the high seas are over-exploited, even more than in the parts of the oceans under national control. And strange things are happening at a microbiological level. The oceans produce half the planet’s supply of oxygen, mostly thanks to chlorophyll in aquatic algae. Concentrations of that chlorophyll are falling. That does not mean life will suffocate. But it could further damage the climate, since less oxygen means more carbon dioxide. For tragedies of the commons to be averted, rules and institutions are needed to balance the short-term interests of individuals against the long-term interests of all users. That is why the dysfunctional policies and institutions governing the high seas need radical reform. The first target should be fishing subsidies. Fishermen, who often occupy an important place in a country’s self-image, have succeeded in persuading governments to spend other people’s money subsidising an industry that loses billions and does huge environmental damage. Rich nations hand the people who are depleting the high seas $35 billion a year in cheap fuel, insurance and so on. The sum is over a third of the value of the catch. That should stop. 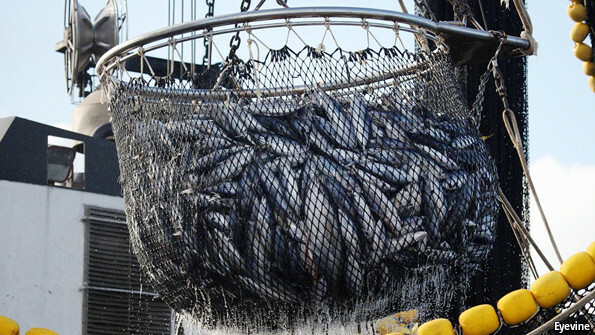 Second, there should be a global register of fishing vessels. These have long been exempt from an international scheme that requires passenger and cargo ships to carry a unique ID number. Last December maritime nations lifted the exemption—a good first step. But it is still up to individual countries to require fishing boats flying their flag to sign up to the ID scheme. Governments should make it mandatory, creating a global record of vessels to help crack down on illegal high-seas fishing. Somalis are not the only pirates out there. Third, there should be more marine reserves. An eighth of the Earth’s land mass enjoys a measure of legal protection (such as national-park status). Less than 1% of the high seas does. Over the past few years countries have started to set up protected marine areas in their own economic zones. Bodies that regulate fishing in the high seas should copy the idea, giving some space for fish stocks and the environment to recover. But reforming specific policies will not be enough. Countries also need to improve the system of governance. There is a basic law of the sea signed by most nations (though not America, to its discredit). But it contains no mechanisms to enforce its provisions. Instead, dozens of bodies have sprung up to regulate particular activities, such as shipping, fishing and mining, or specific parts of the oceans. The mandates overlap and conflict. Non-members break the rules with impunity. And no one looks after the oceans as a whole. A World Oceans Organisation should be set up within the UN. After all, if the UN cannot promote collective self-interest over the individual interests of its members, what is it good for? Such an organisation would have the job of streamlining the impenetrable institutional tangle. But it took 30 years to negotiate the law of the sea. A global oceans body would probably take longer—and the oceans need help now. So in the meantime the law of the sea should be beefed up. It is a fine achievement, without which the oceans would be in an even worse state. But it was negotiated in the 1970s before the rise of environmental concerns, so contains little on biodiversity. And the regional fishing bodies, currently dominated by fishing interests, should be opened up to scientists and charities. As it is, the sharks are in charge of the fish farm. This would not solve all the problems of the oceans. Two of the biggest—acidification and pollution—emanate from the land. Much of the damage is done within the 200-mile limit. But institutional reform for the high seas could cut overfishing and, crucially, change attitudes. The high seas are so vast and distant that people behave as though they cannot be protected or do not need protection. Neither is true. Humanity has harmed the high seas, but it can reverse that damage. Unless it does so, there will be trouble brewing beneath the waves.